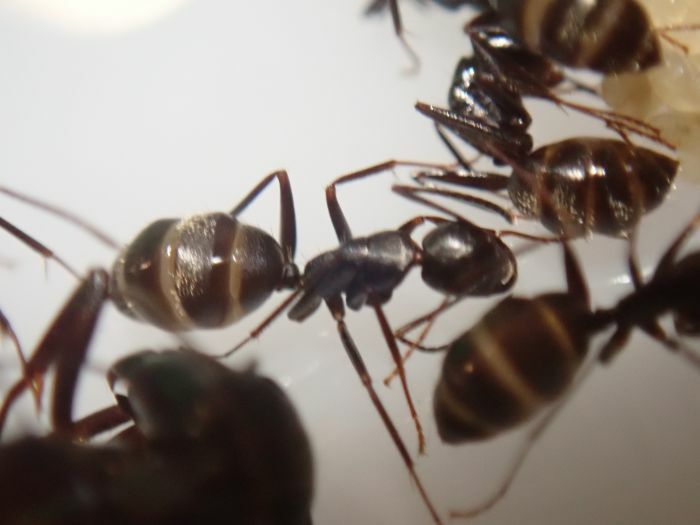 So, about a month back, I finally was able to convince my parents to allow me to keep carpenter ants. 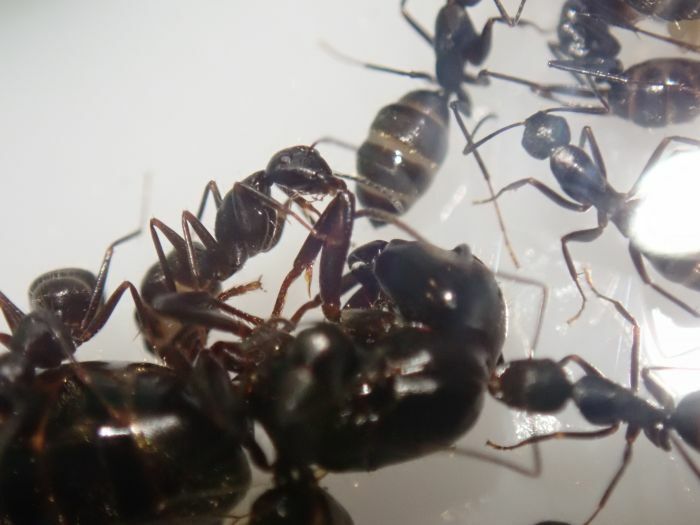 I caught a Camponotus pennsylvanicus queen while camping about 2 weeks ago, but she died a day later and fly larvae hatched from the corpse. Not a great start. Today, however, I found another. Well, my brother and his friends found it and gave it to me. They had her in a Ziploc bag with a dampened paper towel. She only has one of the four wings still attached. Once I got home, I transferred her to a test tube. 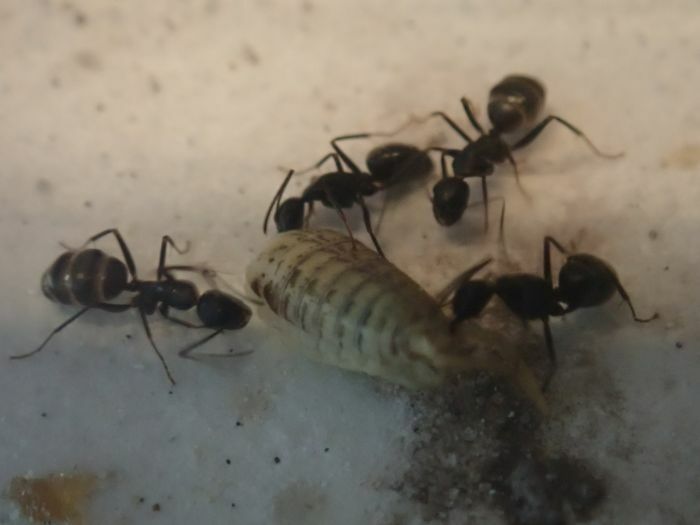 She didn't start pulling cotton immediately like all Camponotus queens I've had before, and within a minute of being in the tube, she started to clean her gaster. One of her back legs in injured, so she walks with a slight limp, but other than that she seems really healthy. 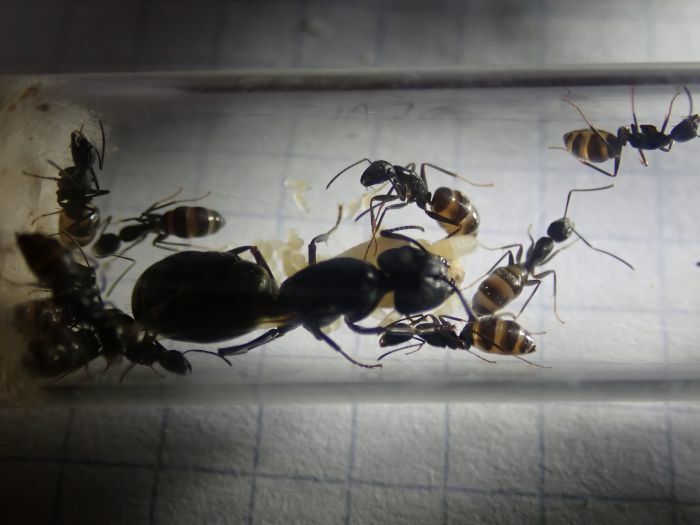 I have high hopes for this queen. I will update this journal once something happens. 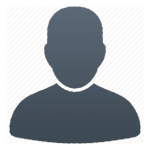 And I will add photos soon. Edited by Mettcollsuss, June 6 2018 - 6:07 PM. Finally, you convince your parents. Good luck! YAY! 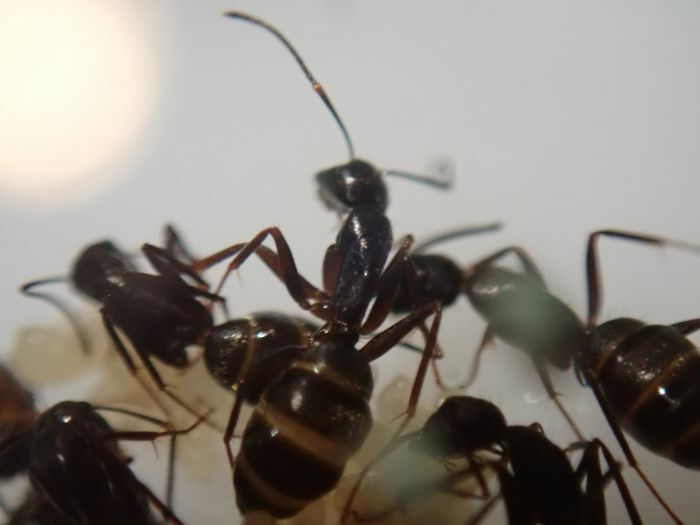 Another Camponotus journal by Mettcollsuss! She has laid two eggs so far. Whenever I check up on her, she starts to freak out and tear at the cotton for a few minutes. Other than that, she is settled in very well. She now has 15 eggs and has stopped gnawing at the cotton. She now has about 20 eggs and a couple 1st instar larvae. 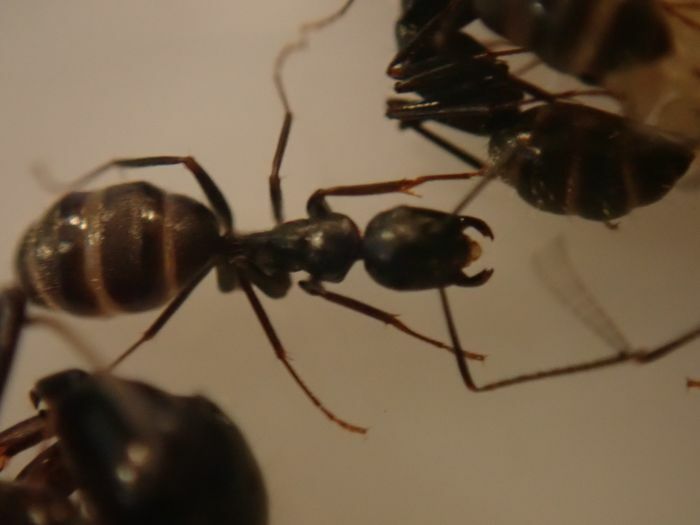 I caught another queen a few days ago, but she still has all her wings and a very small gaster, so I'm thinking she's infertile. 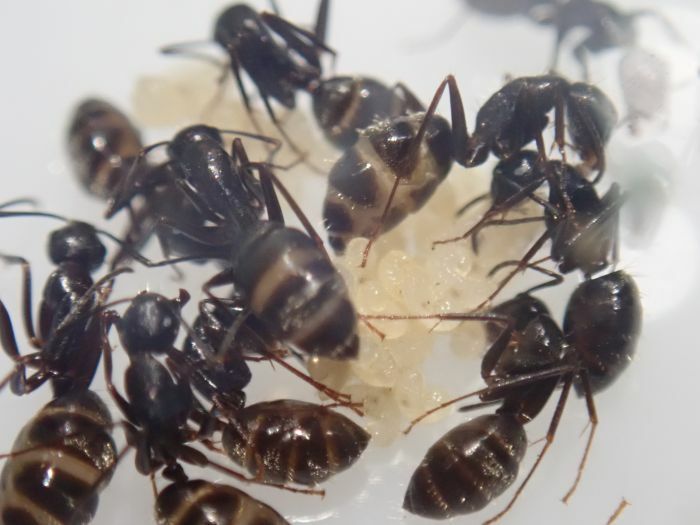 My other queen has several pupae now. I'm about to go on a trip, and I'm expecting nanitics to eclose while I'm gone. I'll update when I get back. Just got back from a 5-week trip. According to the notes left by my pet-sitter, the queen got her first nanitic right after I left. Once they got to five workers, they had to start chilling them in the fridge before working with them to prevent escapes. 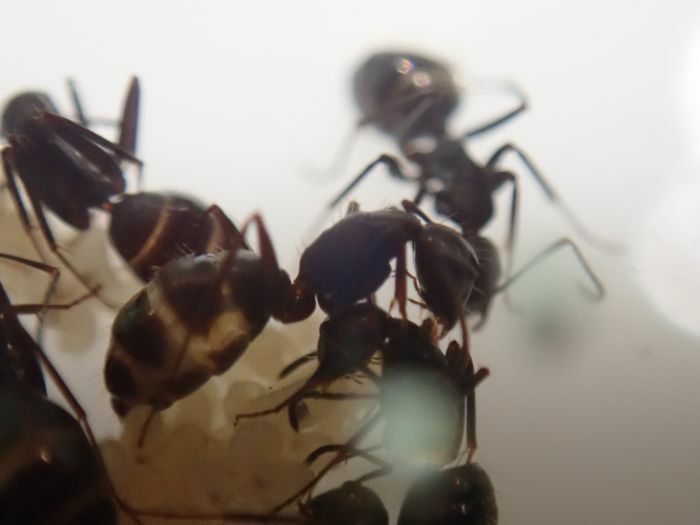 Today, they are at eleven workers and have a healthy brood pile. 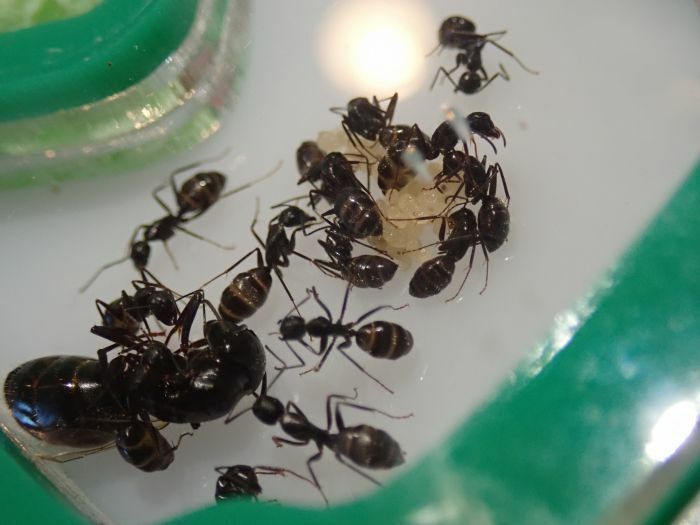 I attatched their tube to a small Ant-Topia outworld to make feeding easier. They fly early in the year. 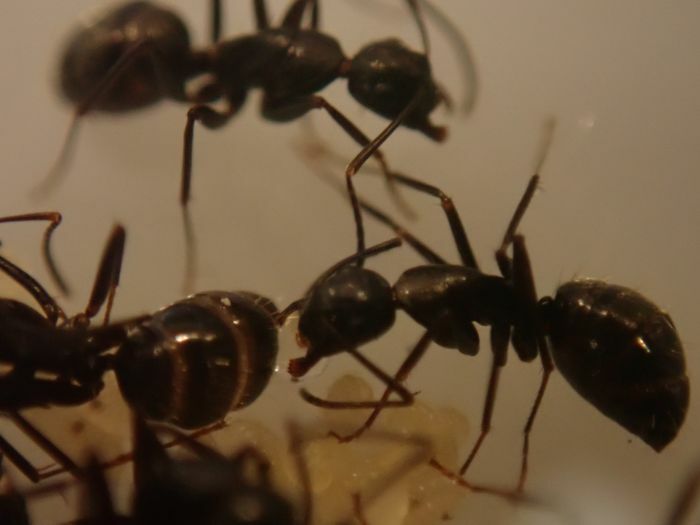 Around 2/3 of the workers are acting as repletes, which might explain their recent lack of interest in the food I present them. Despite not eating much, they are still acting healthy. 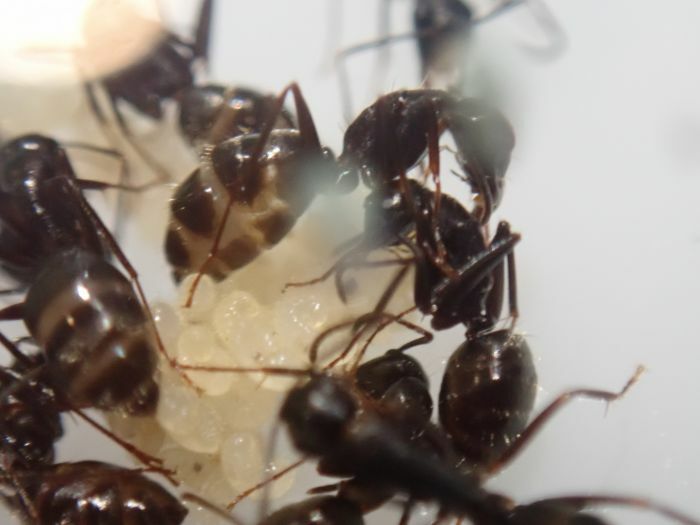 The queen just laid a new batch of 20-30 eggs. 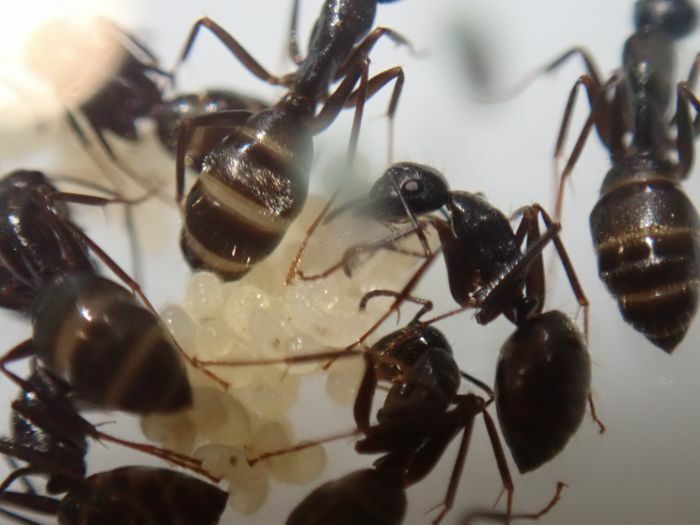 14 workers and lots of eggs and small larvae. There seem to bee three designated foragers that constantly patrol the outworld and nest entrance. All other workers are swollen with food stores. Will try to get photos soon. They're staying at 15 workers for now. They have about 20 small larvae that have stopped development for the year. 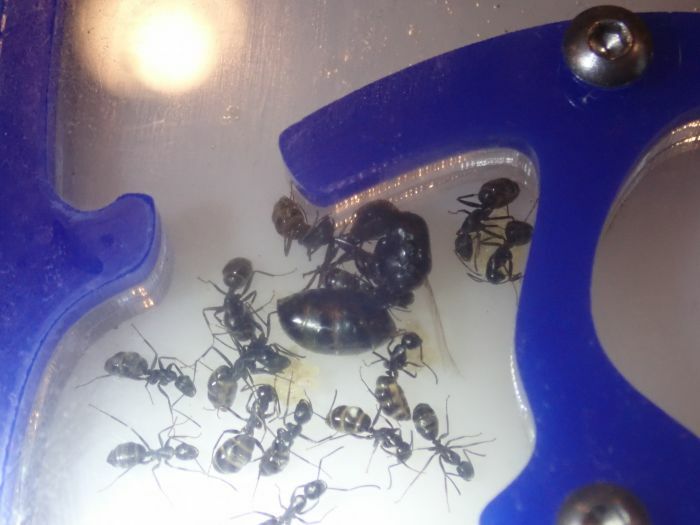 I'm getting ready to hibernate them, I'm just trying to get them to move to a test tube before hibernation because they don't seem to like the acrylic nest. Just put them into hibernation. I know it's a little late, but It took some time to fatten them up enough to get through it well. They weren't hibernating well at 44°F, so I moved them down to 37°F, and now they're hibernating fine. Did a mid-hibernation checkup today. Got some photos. I just removed them from hibernation. I moved them to a smaller nest as the old one was way too big. 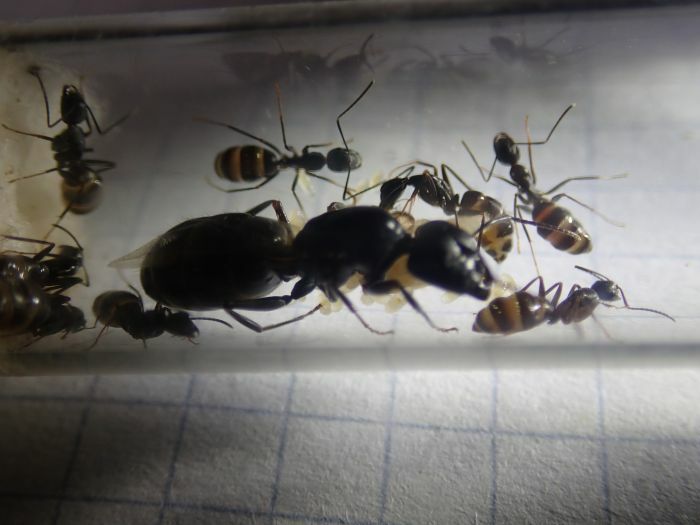 Most of the workers are awake (but still a bit sluggish), but the queen is still asleep. 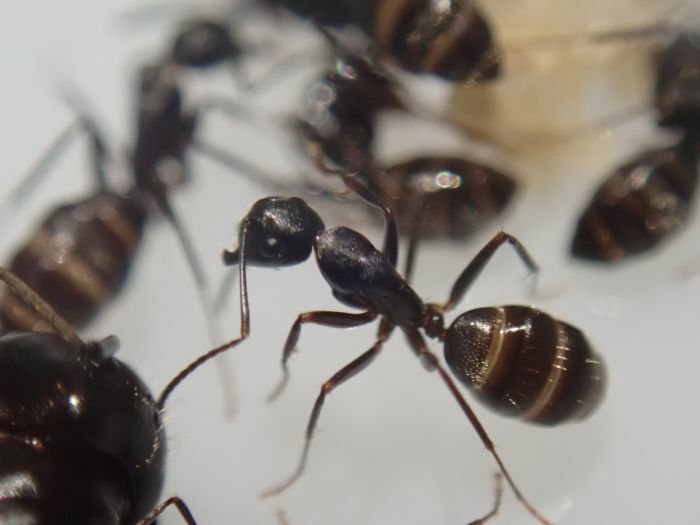 Some photos of sleepy ants waking up. That's a good amount of workers for 1 year. Update us on how well that acrylic nest works. 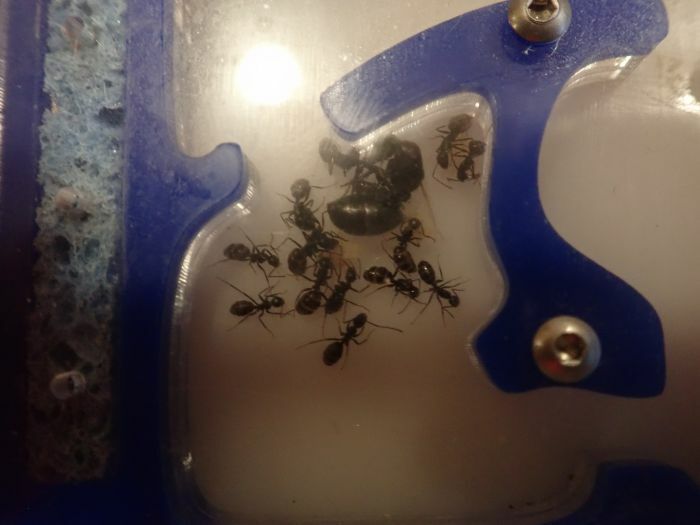 I haven't seen a camponotus colony grow large in an acrylic nest yet. Edited by Ants4fun, January 31 2019 - 12:52 PM.